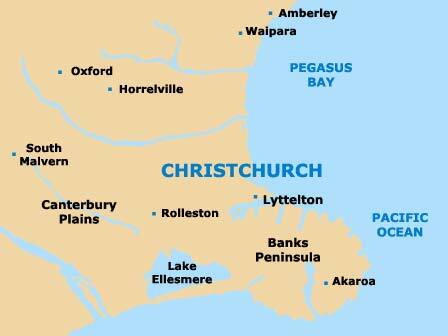 The Canterbury city of Christchurch is rich in heritage, with a number of its most notable landmarks being based around both Victoria Square and Cathedral Square. The latter is where you will find the contemporary sculpture named the Chalice, along with a popular outdoor chess board. Many of the buildings and statues gracing Cathedral Square are listed by the New Zealand Historic Places Trust. However, the earthquake that caused such devastation in the city on 22nd February 2011 certainly left its mark here and in many other parts of Christchurch. A number of the city's most impressive landmarks and monuments are fairly recent, such as the Town Hall in the city centre, which was built in the 1970s and stands close to the Crowne Plaza Hotel. Other sights of interest include the Bridge of Remembrance on Cashel Street, the Library Chambers on Cambridge Terrace, and the New Brighton Pier on the Marine Parade, which stretches for more than 300 metres / 985 feet into the water, replacing the city's previous wooden pier. 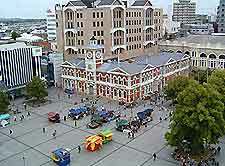 Cathedral Square has long been the hub of Christchurch city centre and is one of the city's main tourist magnets. Widely considered to be the best place to start exploring the city, the plaza is dominated by the magnificent Christ Church Cathedral. Many guided walking tours depart from here, while visitors may also enjoy the lively street entertainment, frequent markets, seating areas, speciality shops and a host of 19th-century Gothic-style buildings. The square is bounded by the 'Four Avenues' of Bealey, Fitzgerald, Moorhouse and Rolleston, and many of the city's districts are measured against this location. The Avon River is one of the most important natural landmarks in Christchurch and has been directly responsible for much of the city's wealth and design. Offering popular punting and boat trips, the river runs next to many historic buildings, parklands, gardens and scenic picnic spots, such as those lining the Cambridge Terrace (north banks) and the Oxford Terrace (south banks). The Bridge of Remembrance is an eye-catching stone archway based within the pedestrianised precinct around Cashel Street. Built in the 1920s as a memorial to those soldiers from Canterbury who lost their lives in World War I, this elegant structure suffered at the hands of the 2011 earthquake, resulting in the need of repair work costing in the region of some NZ$2 million. 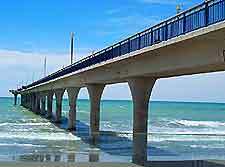 Located within the easterly suburb of New Brighton and on the Marine Parade, the New Brighton Pier was constructed at the end of the 20th century. This popular pier is an impressive sight from a distance, with its Salt on the Pier restaurant offering uninterrupted first-floor views across the South Pacific. The downstairs cafe is a good place for brunch, and this is served from 08:30 onwards. The Town Hall is a fairly recent landmark in the city centre, being built in the early 1970s and standing on Kilmore Street, close to the Copthorne and Crowne Plaza hotels, as well as the Christchurch Casino. Featuring stylish architecture, detailed features and a vast interior containing a theatre, an auditorium and a number of public areas, the Town Hall regularly hosts many of the city's most important exhibitions and concerts. 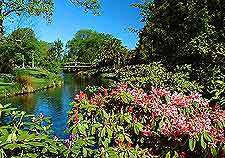 The Heathcote River runs around southern Christchurch and forms many picturesque recreational areas, with peaceful picnic spots and places of extreme natural beauty, particularly around the base of the Port Hills. A series of popular walking trails and cycle pathways line the banks of the river. Victoria Square dates back more than 130 years, when it was a thriving, bustling part of the city. 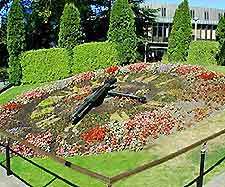 Now beautifully restored, this square contains seating areas, lawns, mature planting, a splendid floral clock and many historic features, including impressive statues of both Queen Victoria and famous explorer Captain James Cook. The Old Stone House is a large building located within the southerly suburb of Cracroft and dates back to the 1870s. Surrounded by attractive gardens, scenic views and a nearby stream, this historic house now operates as a local community centre. Located on the Cambridge Terrace and next to Hereford Street, the centrally located Library Chambers building is situated next to the scenic Avon River and close to Cathedral Square. This heritage structure was built in the late 19th century and features impressive Gothic-style architecture with many original period features. The Cramner Courts is an impressive landmark building presiding over the attractive Cramner Square, where it has stood since being built in the 1870s. With nearby gardens, trees and seating areas, the building features tall towers and Gothic-style architecture, and has formerly functioned as both a primary school and a teacher's training college, being recently converted into luxury city accommodation. Of note, the structure suffered some minor earthquake damage.